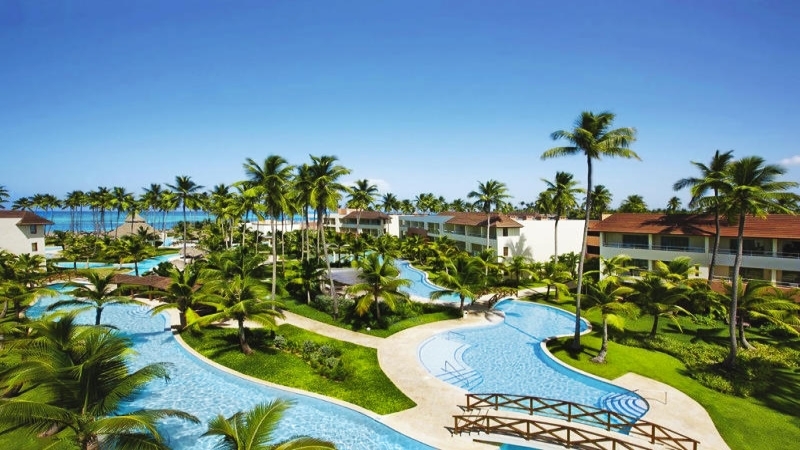 Beautifully located on a palm-studded, sugar white beach in Playa Bavaro, with non stop transfers just 30 minutes from Punta Cana airport, Secrets Royal Beach Punta Cana offers adults a seaside escape to paradise. Lush on-site gardens overlook breathtaking views for a vacation filled with romance and Unlimited-Luxury®. This luxurious adults only (18+) resort has 465 contemporarily furnished guest rooms and suites each with a king or two double beds, daily refreshed mini bar. Guests enjoy a luxurious marble bathroom with shower and double sinks, safe, wifi, and furnished balcony or terrace with Jacuzzi. Indulge in an expansive array of international gourmet meals with no reservations needed at any of our five restaurants, or have a romantic dinner on the beach or in your suite. Guests can order room service 24 hours a day, or feast at the Carnival Buffet which is also open 24 hours. Enjoy your favorite drinks at our six bars and lounges, along with wait service at the pool or on the beach, all serving top-shelf spirits. You can also go to the neighboring Now Larimar Punta Cana where they have nine restaurants and 10 bars to offer a unique food experience while in your trip. And don’t forget, all taxes and gratuities are included. Activities are vast, whether you want to relax or try something new! Float around in the large free form pool/outdoor whirlpool, catch some rays on a chaise lounge by the pool, or walk along the beautiful white sand beach. All non-motorized water sports like snorkeling, sailing, windsurfing, kayaks are there for your enjoyment. You can also tee off at a nearby golf course or try your luck at the onsite casino. Dance and Spanish lessons are taught at the pool. Secrets Royal Beach resort has a state of the art fitness center, and a magnificent spa where you can pamper yourself. In the evening, dance the night away to live music, take in a live show in the theater, or catch a movie on the beach – like a “drive through” without the cars, overlooking the beautiful water. There are so many different ways to experience the perfect vacation for YOU!